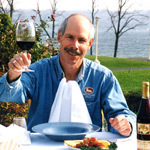 Bob Madill is a founding Partner of Sheldrake Point Winery (1997), Finger Lakes, NY. He serves as Brand Ambassador for the Glenora family of wineries and Wine Director for Red New Winery & Bistro. Bob is Chair of the Finger Lakes Wine Alliance, a member of the Board of the International Riesling Foundation and co-chair for the Wine Symposium of the Finger Lakes. Bob received the New York Wine & Grape Foundation's Unity Award in 2009. Being AWS and WSET certified he judges at US and international wine competitions and is an instructor for the AWS Wine Judge Training Program. Bob's international travels include ProWein, the London and Hong Hong International Wine Fairs and wine growing study tours in Europe..